A retirement home that would fit their site, meet their needs, and stay in budget. The slope was very shallow, making this home easier to build. It did not require a long, narrow plan to fit. There was plenty of room. The plan focused on including everything they wanted in as small of a house as possible. Measuring furniture helped us plan the rooms more carefully. Shortening and straightening traffic paths helped us remove wasted space. This ended up being a better plan in a smaller house. But they had to give up the basement. There was no way to include that in the budget. The clients had planned well for this project. They provided lots of detailed information of what they wanted. They learned a lot about construction to help them make better decisions. 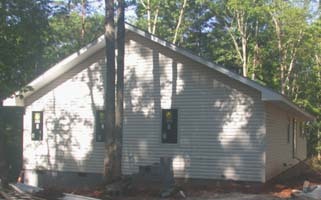 Even though this home was simple and easy to build, they were very concerned that the trades people would do their jobs properly, especially since they would be back in Florida and not able to watch the construction. They hired me to inspect regularly. Would the builder accept this? I explained that I would try to be easy to work with, but my job would be to make sure everything was done right for my clients. I found several issues. The wrong floor beam was used. The house wrap was not installed correctly, which might cause a leak. Each time I emailed the builder first to give him the opportunity to resolve the problem. Then I reported the issue to the client, including photos, and explaing how the builder was fixing it. At the end this worked out better for everyone. The clients have enjoyed living in their home for years.